Fort Meikel no longer exists. It was constructed in 1864 adjacent to the Petersburg and Norfolk Railroad. In the 1950s, the fort was still there to visit. In the intervening years, the ground was strip-mined, likely to build the Interstate. Thanks to high-resolution images posted on the internet by the Library of Congress, we can revisit the scene and see how the fort appeared from the outside looking in to Timothy O'Sullivan and his crew. One view (LC 00518) looks south from Fort Morton. A second view (LC 00530) looks south from Battery XVI. 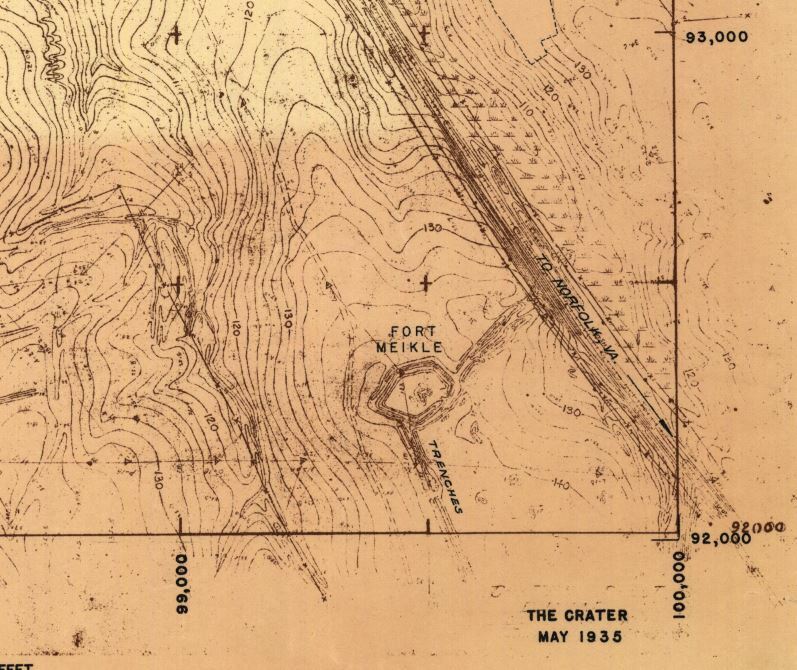 Detail of 8-inch = 1 mile composite showing Fort Meikle [Meikel]. Plan of Fort Meikel, Headquarters Army of the Potomac, Engineer Department. Courtesy of Petersburg National Battlefield. 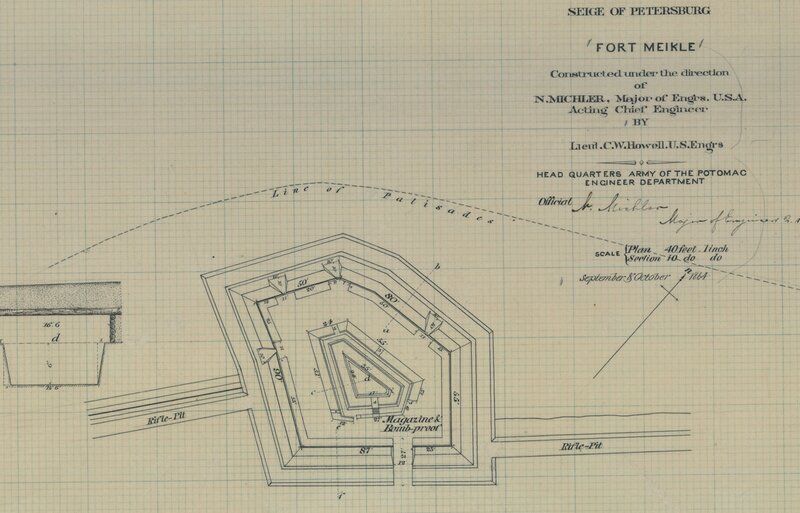 Detail of Plan of Fort Meikel, Headquarters Army of the Potomac, Engineer Department. Courtesy of Petersburg National Battlefield. LC 00518 section. View from Fort Morton looking south. Forts Meikel and Rice are within the blue box as magnified below. 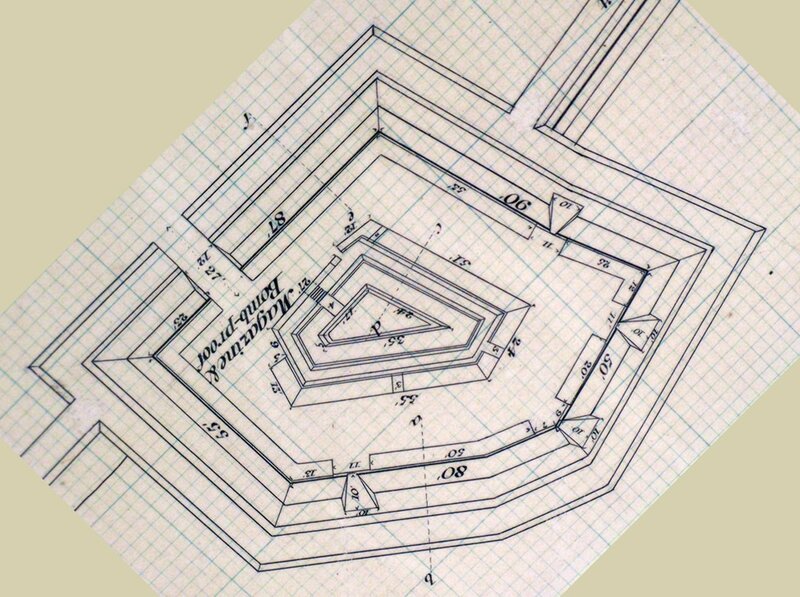 Engineers' plan of Fort Meikel rotated to match view from Fort Morton. Bottom of page is approximately north. Please note the spacing of the embrasures -- one alone looking north at the camera, two together farther to the left, angling away from the camera. LC 00518 detail. 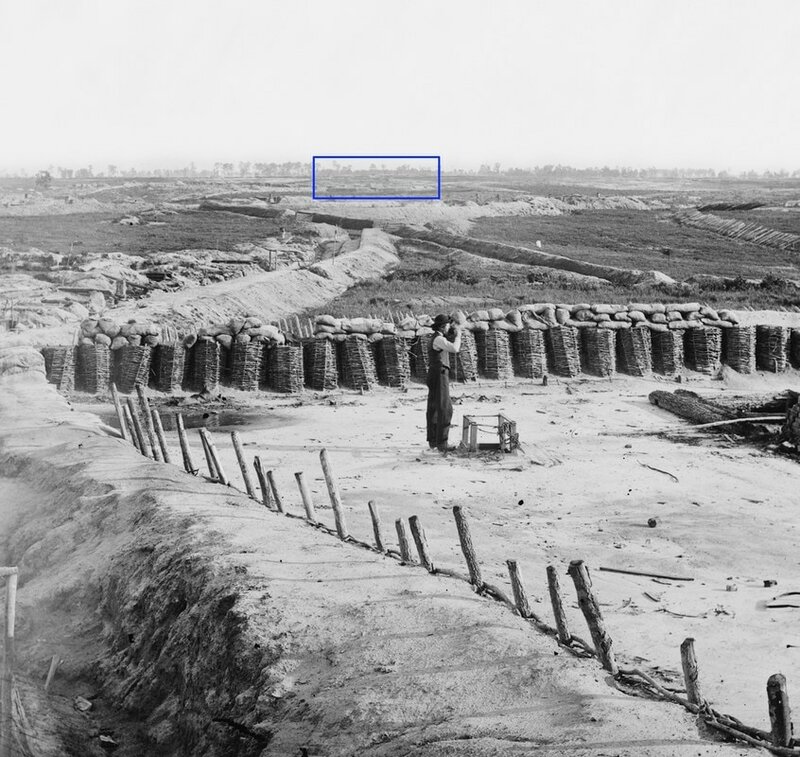 Magnification of Forts Meikel (foreground) and Rice (distant) as seen from Fort Morton. Image enhanced by Phil Shiman. LC 00530 detail. Magnification of Forts Meikel (foreground) and Rice (distant) as seen from Battery XVI. Image enhanced by David Lowe. LC 00530 detail. 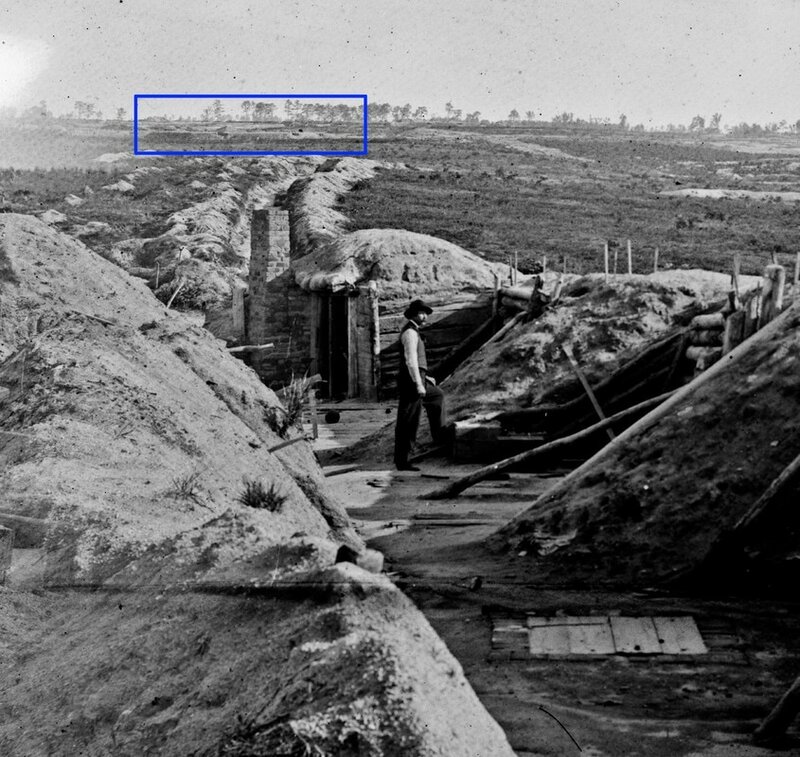 View of Fort Meikel (inside blue box) looking south from Battery XVI. Timothy O'Sullivan posed in the photo.